so close to beaches restauarants shopping and yet far enough removed so it was tranquil and quiet. service was excellent nothing too much trouble only critisim was the driveway crushed stone. 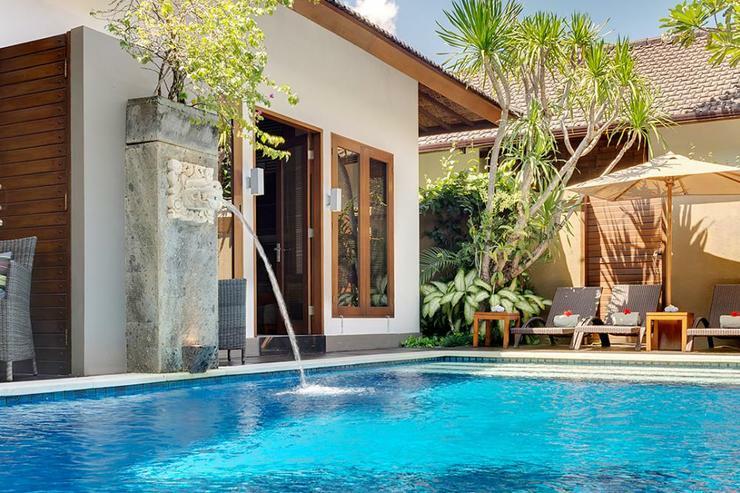 Lakshmi Villas were complete luxury, my wife went to Bali for the first time, and found the Villas to be absolutely perfect. Five stars are not enough i'd rate them six stars, the star were kind, polite and genuine,the facilities perfect. 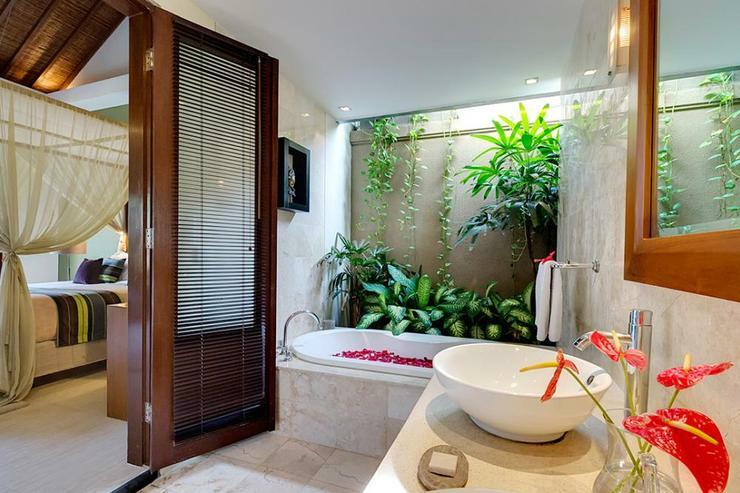 There was nothing wrong with these villas, everything was perfect. As usual the service was top flight and personalized. I am a repeat visitor (usually stay once a year). 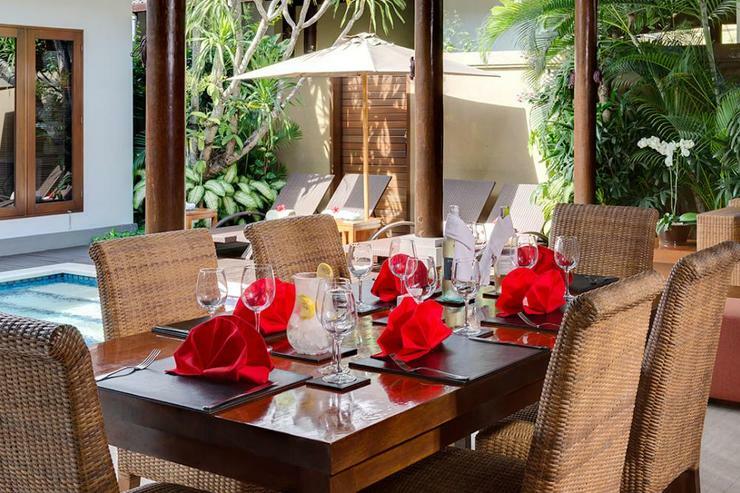 I've seen lots of changes in Seminyak -- including more competition in accommodations -- but Lakshmi is still the best of the bunch. 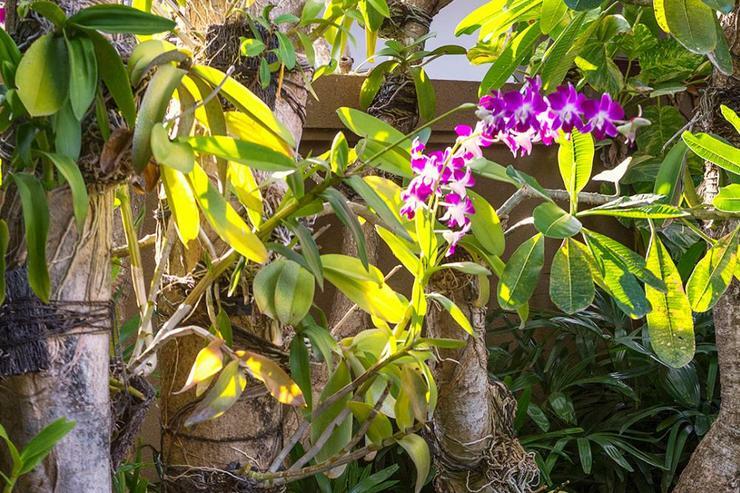 Perfect location -- convenient to everything yet still an Oasis of tranquility and comfort. Look forward to my next stay! 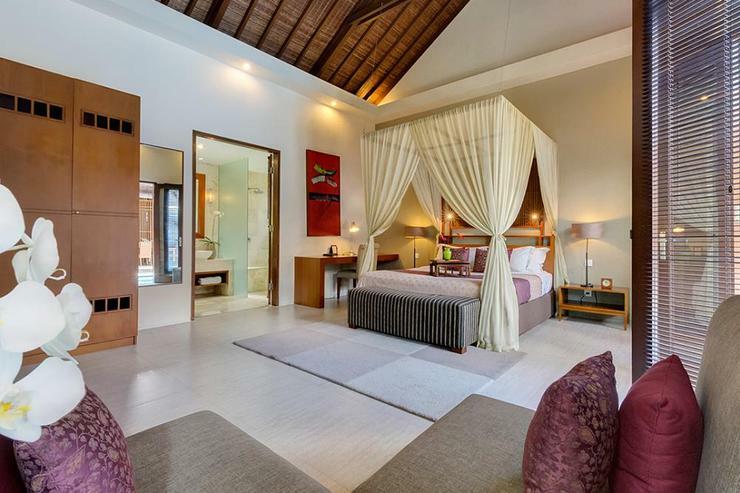 The staff were amazing and attentive, helpful and accommodating at Lakshmi Villas. 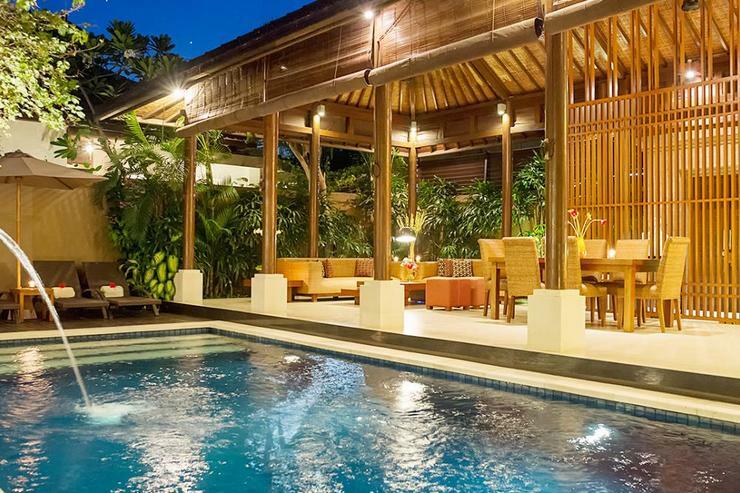 The rooms were clean and the pool and dining area was just what we needed to celebrate 4 aussie girls 40th in Bali. It was walking distance to Bodyworks for a massage, Sea Circus for some tacos, La Luccialo for sunset and Mexicola for frozen margaritas. From the moment we were picked up at the airport we were taken care of from all the staff at Lakshmi Villas. They were very helpful arranging massages at the villa, preparing our breakfasts and dinners, cleaning the villas and topping up our supplies of water and towels. 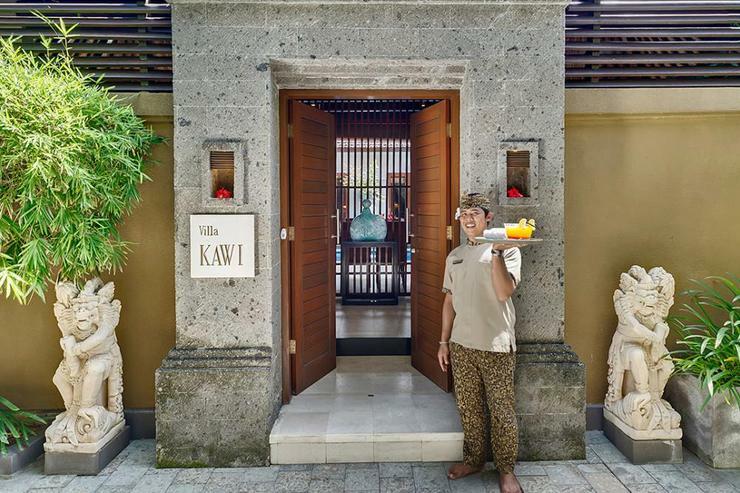 An awesome stay at Villa Kawi!! Loved the villa, staff were excellent, meals were good. Would definitely stay here again. Only one slight problem if you are a light sleeper.. The rooster next door, it's so loud. 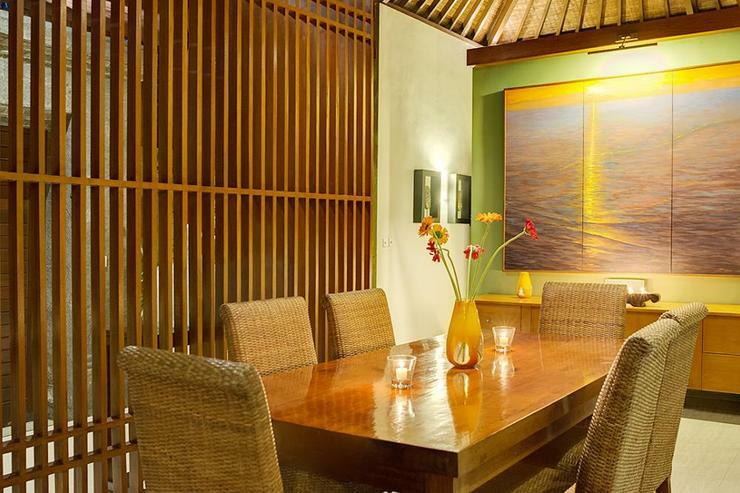 Villa Kawi enjoys a tranquil location at the end of a leafy avenue right in the heart of Seminyak. 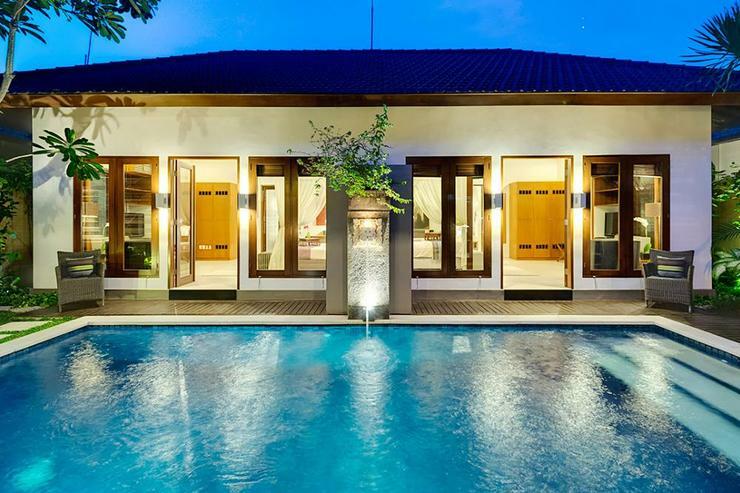 The property is about 20 minutes drive from the airport and only a few minutes from the well-known beach and restaurant district of Legian/Oberoi. 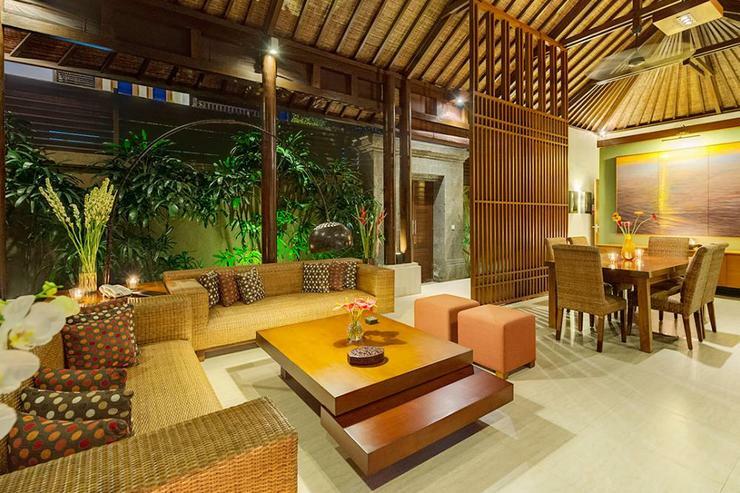 Villa guests are also well placed to enjoy the many cafes, boutiques, spas and bars located in the Seminyak area. 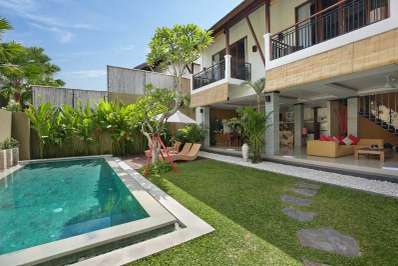 * The villa can be booked with the adjoining villas within the complex to include up to seven bedrooms. 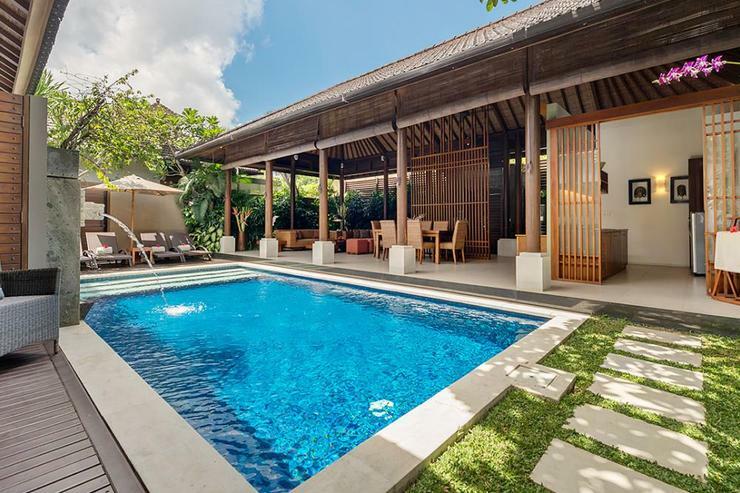 Incorporating elements of Balinese design, villa Kawi is a contemporary villa that provides all comforts of a luxurious tropical experience. 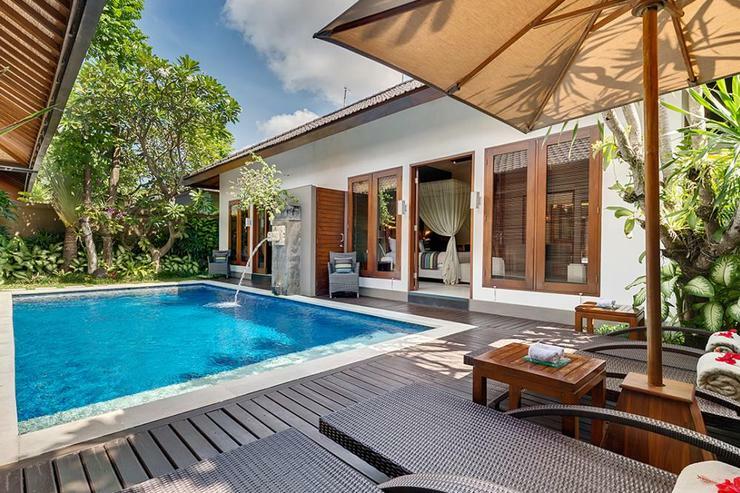 The swimming pool is the central feature at this single-storey villa, with an open-plan living area and kitchen on one side, and two adjoining bedrooms on the other. 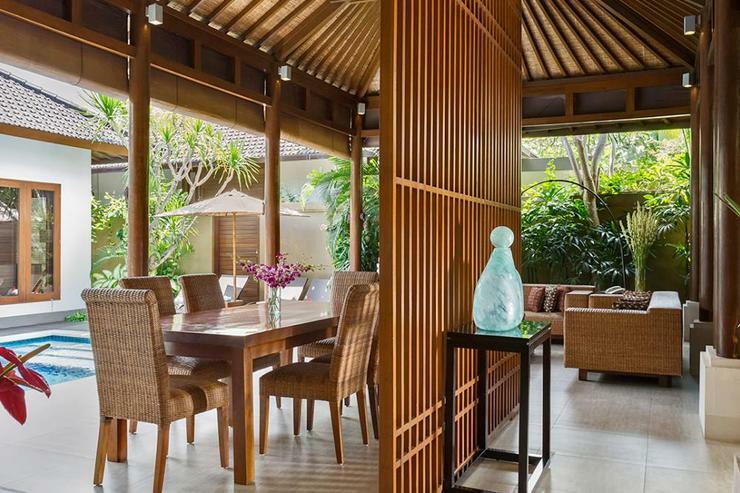 The atmospheric open-sided living pavilion overlooks a swimming pool dotted with panda nus palms and frangipani trees. 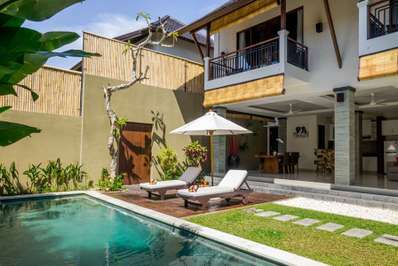 Perfect for small families or two couples sharing, the villa can be booked separately or with the adjoining one-bedroomed villa Solo. 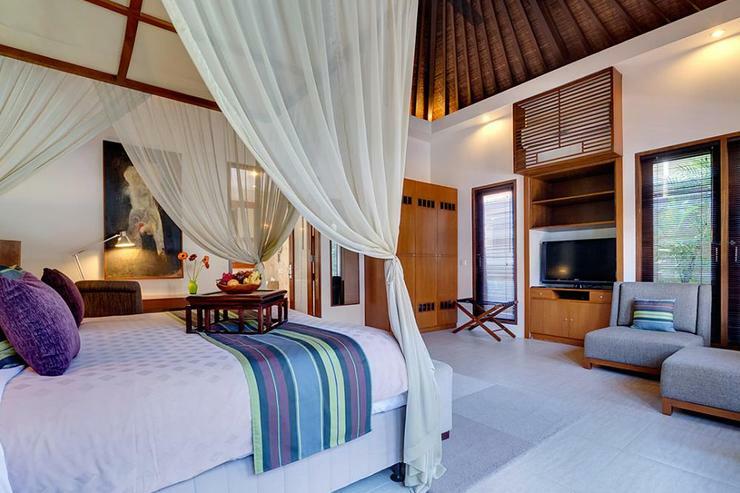 The two air-conditioned bedrooms of villa Kawi are identical in size and features, with soaring ceilings and smooth ivory-hued stone floors. They both have king-sized beds, one of which can be converted to twins. Comfortable chairs form a sitting area while the flat-screen satellite TV with DVD player provides entertainment. 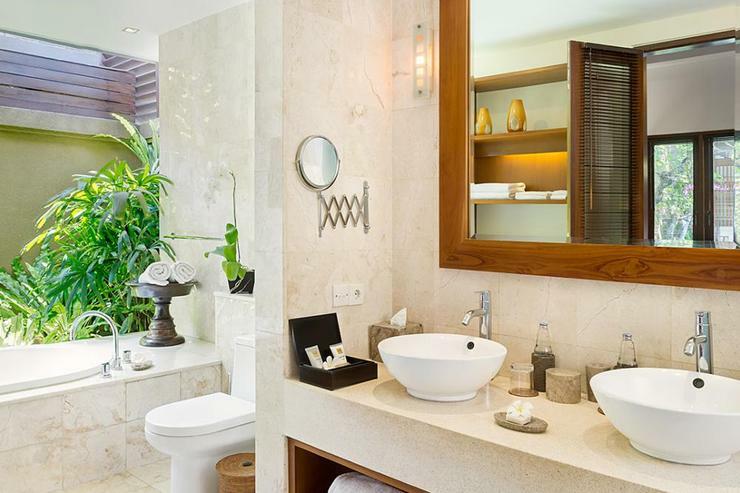 Both bedrooms have semi-outdoor garden bathrooms with marble floors, bathtub, walk-in rain shower and customized amenities. 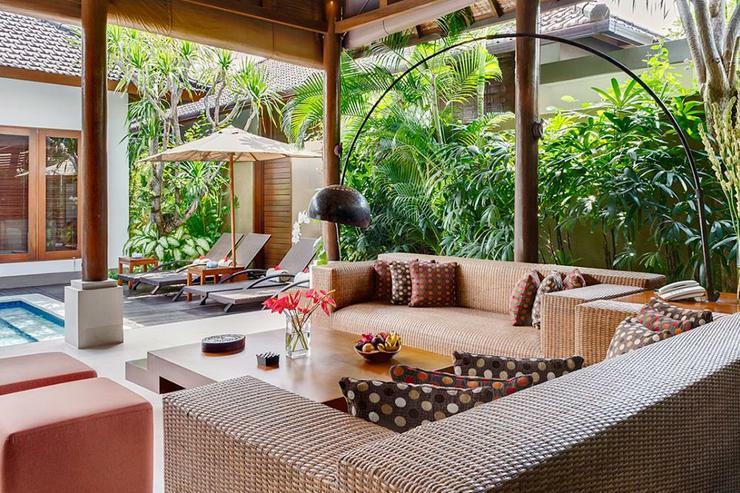 The entrance of villa Kawi leads into a fan-cooled, tropical-style living pavilion fitted with rattan sofas arranged around a wooden coffee table. A highly polished wooden dining table seats six. 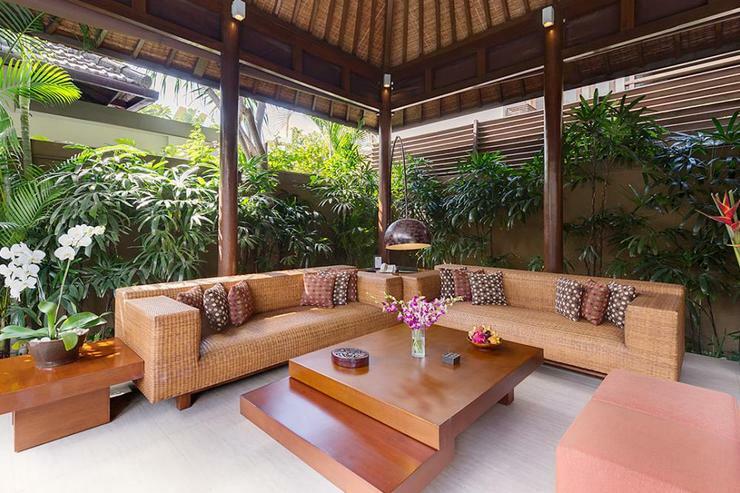 The area also has a Balinese-themed coffee table books and an iPod dock. 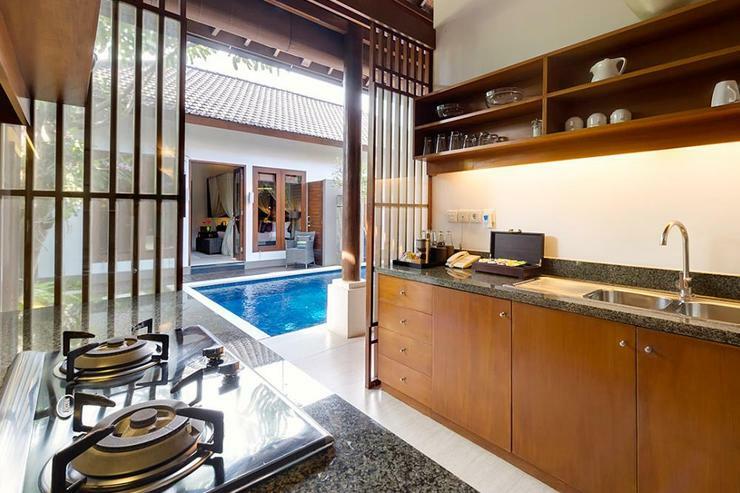 A guest kitchen adjoins the lounge room and provides all the essentials for tea and coffee-making, cool drinks from the mini bar, or for whipping up a quick meal. 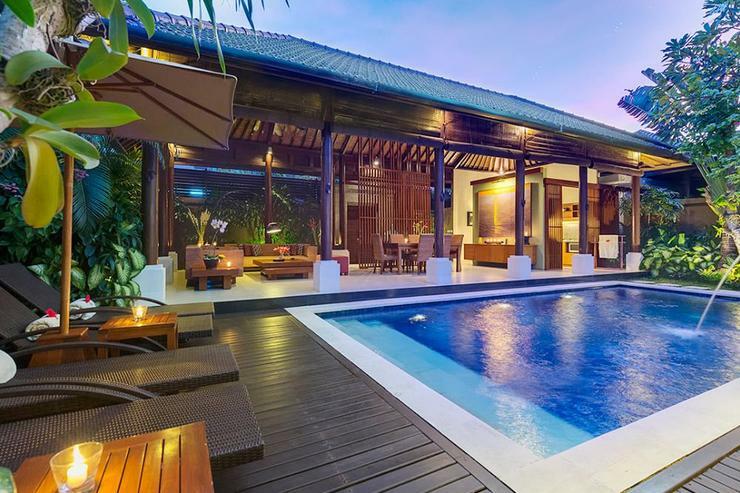 The living room and kitchen open onto the pool and garden, where four loungers shaded by a parasol are arranged on a timber pool deck. Long-standing staff including an inhouse chef provides discreet professional service.